Tired of bending over to work on stuff on the floor. Example: working on lawn mower... so first thought, want one that gets really low to the ground so easy to man handle what ever on to it. Second thought, would be great if there was one that you could wheel under like a table. 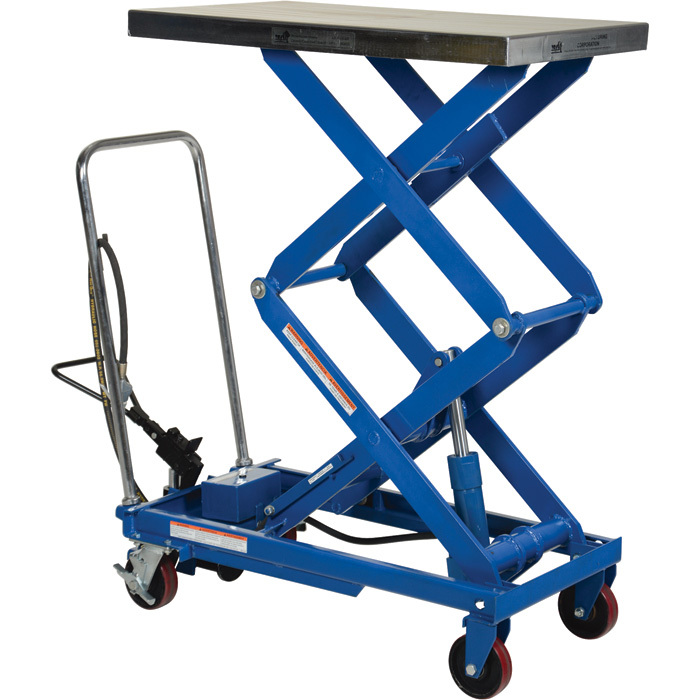 Looking to get a hydraulic work cart. For those that have one or experience with them looking for recommendations or pointers on what are good and bad features etc. You might want to consider the availability (even if you add it on, aftermarket) of a means of securing <whatever> onto the work surface. I don't imagine you'd be happy if <whatever> fell off, once elevated (potentially ONTO you!). Having brakes on at least two wheels is probably worthwhile (both of the above examples seem to have them) as it would be clumsy to try to "block" it into remaining stationary. You might also want to arrange to affix a hinged flap to the "front" edge to help you coax <whatever> onto the platform. Note that a piano hinge affixed to the edge of the platform and a suitably sized sheet of steel would allow the "ramp" to automagically fold down as the platform is lifted (so it doesn't present a hazard while you're working). Also, an electric screw drive may be sufficient (and easier to use) depending on the weight limit you're trying to accommodate. This kind of design seems pretty cool... no clue on the cost or a US source. Last edited by NW-Will; 02-10-2019 at 04:38 PM. 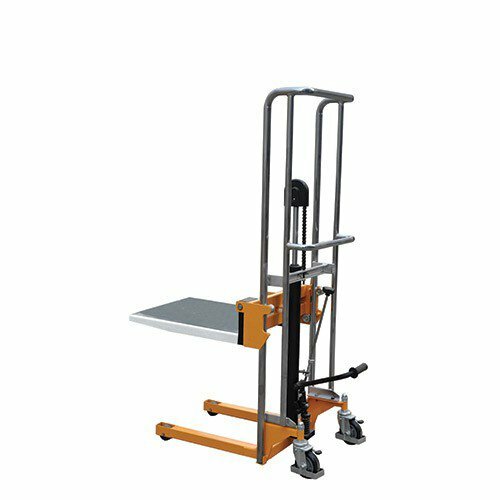 Look at Harbour Freight's motorcycle lift. I got one before injury to work on my bikes. I now use it as work table. Also, I can drive or push a power chair on it, lift it up and work on it. How easy is it to roll around? 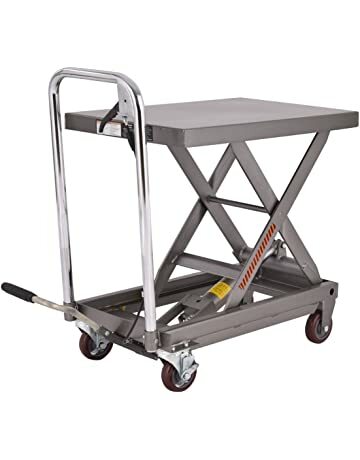 Can you detach the ramp once it's elevated? Once it's elevated, and the ramp removed, what kind of knee clearance is there at the end you could roll under? Yes, ramp has 2 pins (welded on) that goes in 2 holes in lift. It's heavy, I recommend removing before you lift it up. Before injury, I could roll it around with a mid size bike on it. Rear wheels slide sideways easy on smooth concrete. Nothing on it and raise up, I can very easily push it around. Not shown in pic is the safety bar that installs in 1 of 2 height positions (see hole near guys left foot). As a roll up to work table, I have mine in top holes. ALWAYS USE SAFETY BAR to prevent accidental lowering (easily can happen) or hydraulic leak down. I remove pump pedal (just slides on/off) and work from that side (due to my garage being full). In my Permobil C300, lift at top hole safety pin position, lower lift to that position, my knees are an inch or so below table. I would not work off the front of lift, it may tip forward, injure you and/or dump your project. A big front drive power chair will go up and onto lift but BE CAREFUL because you don't have room for a mistake. Mid drive chair may require additional ramps to decrease incline. Again, don't put all weight on front of lift! You can get this with an electric pump for extra $. It retains manual pump as well. This thing is heavy, requires a truck or trailer. Unloading is tricky. I can tell you how to unload with out a fork lift it if you decide to get one. Also many tweaks, safety, and set up suggestions. Last edited by SCI-Nurse; 02-12-2019 at 07:06 PM.